Will it be third time lucky for Di Carlo and Chievo? Chievo have appointed their third manager in as many months, and it is a familiar face who has been placed in charge. Following a bleak four-game reign for former Italy boss, Gian Piero Ventura, the Verona-based club have put their faith in Domenico Di Carlo for a third time. The side sits rock-bottom of Serie A, nine points from safety, having been deducted three points back in September for false accounting. Can Di Carlo pull off a remarkable escape, or has he been left with too much to do? Here we look at the challenge that faces him. Di Carlo’s history with Chievo dates back to 2008. 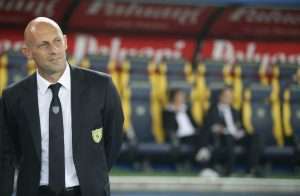 In his first spell in charge, he steered the club to 16th place in 2009, before achieving slight progress the following year, with Chievo ending the campaign in 14th. This impressed fellow Serie A clubs, with Sampdoria obtaining his services in the summer of 2010. Yet he returned to Chievo just a year later. This time he failed to leave on his own terms, with the club’s hierarchy relieving him of his duties in October 2012 due to a dreadful start to his second season at the helm. It could easily be argued that two stints at the same club is enough, but not for Di Carlo. He has jumped at the opportunity to try and save his beloved Chievo, declaring “we’ll play with the Chievo spirit”, whilst referring to the shirt as “a magical jersey”. Many feel that Chievo are destined for relegation. Di Carlo does not appear to be one of them. What is Chievo’s best formation? This is a key issue that Di Carlo needs to address. Rolando Maran, Chievo’s manager for much of last season, relied heavily on a 4-3-1-2 formation. His successor, Lorenzo D’Anna, opted to play a 4-3-3, with Ventura then switching to a 3-5-2 upon his arrival. None of these systems have brought positive results, and the constant tinkering of formations can hardly help the players. Chievo have scored the joint-fewest goals this season, whilst conceding four more goals than any other club, highlighting how the balance of the side is a major worry. Ventura appeared to move to three at the back in an attempt to build defensive solidity, with both wing-backs dropping deeper when defending to make a back five. This failed miserably though, with the team conceding eleven goals in four matches. Would a more attacking approach pay dividends? This is what Di Carlo will be pondering ahead of the weekend. Chievo’s summer recruits have underwhelmed. The signing of Joel Obi from Torino looked an exciting one. Capped 17 times by Nigeria, the midfielder was expected to add some much-needed creativity in the middle of the park. This has not been the case, with a combination of lack of form and fitness issues restricting his game time. He has failed to complete 90 minutes yet this season. Luca Rossettini has become a regular in the defence since arriving from Genoa, but has been unable to steady the flow of goals conceded. The experienced centre-back was omitted from the squad for his final games at Genoa, as the club seemed to decide that at the age of 33, his best days were behind him. Given his performances so far for Chievo, it is hard to disagree with Genoa’s assessment. Chievo also looked outside of Italy for fresh talent, bringing in Federico Barba from Spanish side, Sporting Gijon. Recognised as one of the best defenders in Spain’s second tier last year, the acquisition of Barba seemed a good piece of business. Barba has been deployed at both centre back and left back though, causing him to perform inconsistently. Indeed, he was sent off in a humiliating 5-1 home defeat against Atalanta last month. Di Carlo must get more out of this crop of players if Chievo are to have any chance of avoiding the drop. The situation appears hopeless for Chievo right now, but they do not have to look back too far for inspiration. In the 2016/2017 campaign, Crotone survived on the final day having been eight points from safety earlier in the year. Ahead of Chievo’s most recent match, veteran goalkeeper Stefano Sorrentino stated: “We are ready to look for the first victory that will ignite that spark.” Momentum can change quickly in football. Chievo must believe they can still turn their fortunes around. Di Carlo’s Chievo will return to action this Sunday when they travel to second-placed Napoli. His first home game will be against Lazio, another tricky assignment. He is unlikely to be judged on these games. The following two fixtures see Chievo face Parma and SPAL, more appealing matches on paper. Here it will become clearer as to whether any progress is being made. Without a win in their opening 12 games, Chievo are in deep trouble. Yet Di Carlo is back and convinced that he can rescue the club from relegation. With 26 games still to play, survival remains a possibility. Rest assured, Di Carlo will not be giving up anytime soon.